At the foot of Shock Hill, Mountain Thunder Lodge townhomes for sale seem much closer to town than skiing, but just across Park Avenue is the gondola terminus. And a skiway that begins on Peak 8 takes skiers past all the residences at Mountain Thunder and under the road to the gondola. Just over a hundred homes, Mountain Thunder Lodge was built in the 21st century with a style reminiscent of the 18th. Victorian details ornament its modern mountain style. Uniquely ski-in and ski-out, Mountain Thunder is convenient without skis, too. It’s still only a few-minutes walk to Main Street, and its shops, restaurants and grocers. Learn more about the different Breckenridge real estate options offered, or explore all of the Mountain Thunder townhome listings below. Mountain Thunder Lodge real estate is a mix of a large lodge building and several smaller buildings of condos - ski-in and ski-out by virtue of this unique skiway and tunnel to the gondola. The large lodge building offers on site management, elevators, a fitness room, hot tub, and pool. And the adjacent buildings, a smaller, more intimate kind of lodging, but with access to the lodge amenities nearby. Vail Associates built this property with studio to three-bedroom units and continues to manage this diverse complex. On the north side of Ski Hill Road, Mountain Thunder Lodge is an easy, one block walk to the large grocery store City Market. The free town bus stops outside Mountain Thunder Lodge, and the public transportation hub, near the gondola, is where free buses leave Breckenridge and connect to the other Summit County ski resorts and town. Several trails in the Breckenridge open space program begin near Mountain Thunder Lodge and climb up to Shock Hill and the Cucumber Gulch Wildlife Preserve. Size (SFLA): 493 sq. ft. to 1610 sq. 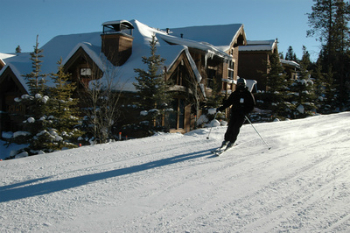 ft.
Mountain Thunder Lodge is located directly west of the gondola on the north side of Breckenridge off Park Avenue. From the Breckenridge traffic circle take Park Avenue to the south. In less than ½ mile turn west (right) on Mountain Thunder Drive. Do you want to talk to an expert about your Mountain Thunder Lodge real estate opportunities? Contact us online or call us at (970) 453-2200. Listing information last updated on April 19th, 2019 at 9:03pm MDT.